1970 429 Cobra-Jet Torino GT being considered somewhat of an overlooked "sleeper" in the muscle car universe. "You either love 'em or you hate 'em,"
The Torino GT was the sporty, performance version of the Torino. It came only in the fastback and convertible body styles and is often viewed today as the underappreciated cousin of the omnipresent Mustang. 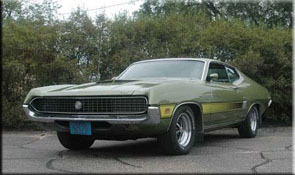 At 3,173 lbs., the hardtop Torino was a big car in 1970, and it came with some big engine choices to match, not the least of which was the 429-cid, 370-hp Cobra Jet option. For buyers even more drag-racing inclined, there was also a 375-hp Super Cobra Jet option. A 302-cid V-8 was the standard power plant for all the base Torinos that year, but buyers could also opt for a 351-cid Windsor V-8, or 429-cid Thunder Jet mill, in addition to the CJ and SCJ choices.